Rabbi Soffin of Jewish Helping Hands with children near the dump in Guatemala City. 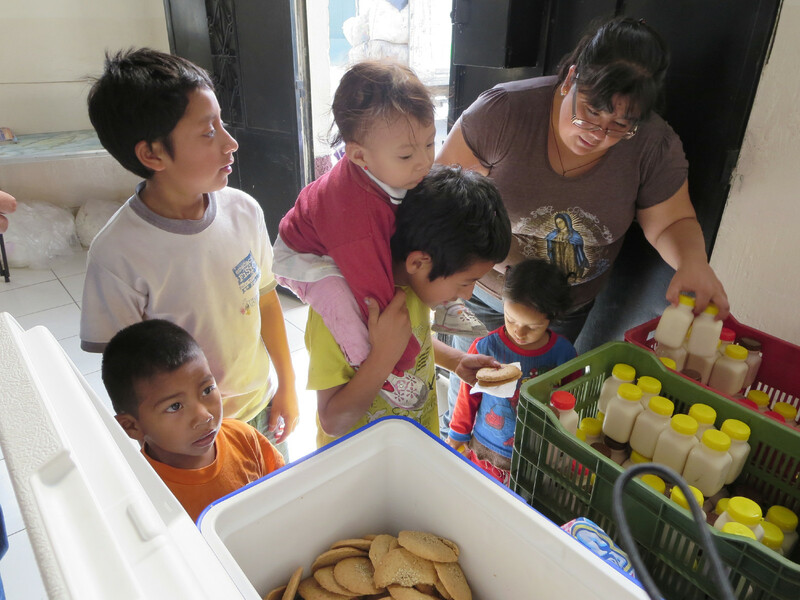 Children of families living off the huge dump in Guatemala City line up for soymilk and enriched cookies. Three and a half years ago, inspired by Plenty’s beloved Board Chair, Karen Heikkala, who had recently passed away, we began working with a group of Guatemalan women (Grupo de Soya Santa Maria or GSSM) to improve the nutrition intake of undernourished and vulnerable children living in squalor at the entrance to the Guatemala City land fill and waste dump. containing 11 grams of protein, plus iron and calcium. They have been providing nutrition and soy processing workshops twice a month for women living around the dump. Additionally, they have started producing a third of the soymilk they distribute to the children. They also completed legal registration of their partnership, receiving a commercial license allowing them to sell their soy foods in the neighborhood. Many thanks to Jewish Helping Hands and Chris Gruener for their funding support. Representatives of Jewish Helping Hands even traveled to Guatemala to observe the project first hand. If Plenty is successful in attracting sufficient funding and donations, GSSM will continue distributing these soy foods to more than 300 undernourished children and 25 elderly people on Wednesday and Saturday mornings. This costs $5.00 a month, or $60.00 a year per child. Misioneros de Caridad fund a distribution of fortified cookies to about 125 kids on Fridays.